Every time my friends Bill and Rebecca have a dinner party, I stop at Bi-Rite Market on my way over to pick up a little wedge of Rebecca’s favorite cheese, truffle Pecorino. It always amazes me how this absolutely gloriously decadent-tasting cheese can bring that rich truffle flavor to a dish for the very reasonable price of about $5 for 1.5 oz. (trust me, you don’t need much). I found a similar cheese, called simply “Italian Truffle Cheese” at Trader Joe’s for slightly less. Either would work well in this recipe. Cook capellini in boiling salted water until al dente, about 3 minutes. Drain and return to pot. White capellini cooks, heat the olive oil and butter together over medium-low heat in a medium frying pan. Add garlic and cook for 1 minute, stirring frequently. Add shrimp, parsley, lemon juice and lemon zest. Cook, stirring occasionally, until the shrimp turn pink. Remove from heat. 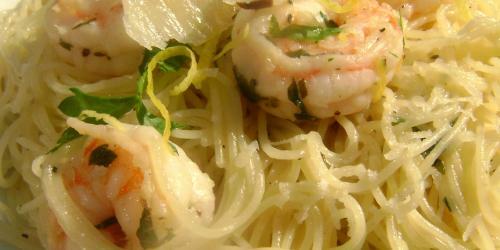 Gently toss the cappelini with the shrimp-butter-oil mixture and salt and pepper to taste. Sprinkle with truffle cheese and give it another few gentle tosses. Serve hot, on plates or in bowls, garnished with more parsley, lemon zest and truffle cheese. Good post. I learn something totally new and difficult on sites I stumbleupon daily. It’s always fascinating to read articles from the other freelance writers and practice a little something from other online sites. The data in this blog entry is totally marvelous! What’s more, it will enable me complete my paper about the https://myassignments-help.com.au/ site. I am greatly content with this work from the essayist here. Cherished it!